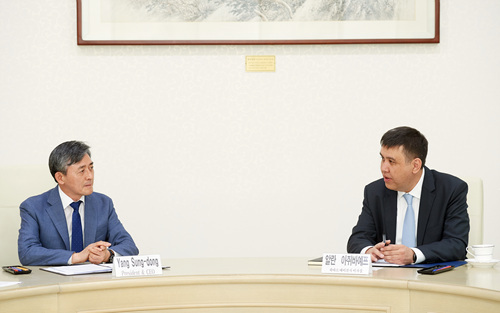 KBS President and CEO Yang Sung-dong(left) meets with Kharbar Agency Board Chairman Alan Azhibayev at KBS. KBS President and CEO Yang Sung-dong(left) and Kharbar Agency Board Chairman Alan Azhibayev sign an Implementing Arrangement. Representatives of KBS and Khabar Agency pose for a group photo after the signing ceremony. 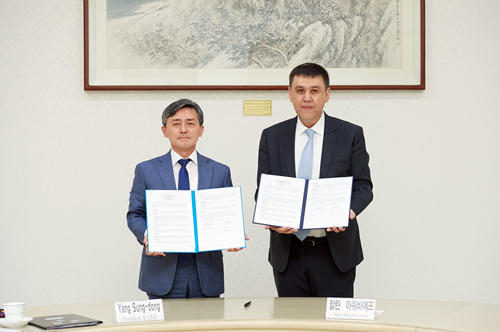 On August 7, 2018, the President and CEO of KBS, Yang Sung-dong, and the Chairman of the Khabar Agency Board, Alan Azhibayev, signed an Implementing Arrangement between KBS and Khabar Agency, a major media organization in Kazakhstan, at KBS Seoul Headquarters in an effort to pursue substantive cooperation on exchange of content as well as professional and technical expertise, and co-production. In the form of an ‘Implementing Arrangement,’ the new agreement is the next phase of the existing Memorandum of Understanding on Co-operative Relations in Broadcasting between KBS and Khabar Agency, initially signed on October 28, 2014 in Macau, China. KBS President and CEO Yang Sung-dong welcomed the new partnership with Khabar Agency and said he is looking forward to working closely with the Kazakh media organization. Mr. Yang stressed that Korean audience has a keen interest in Kazakhstan particularly as there is a large number of ethnic Koreans living in the country. He also mentioned that there has been an emerging view that Korea needs to develop mutually-beneficial economic cooperation initiatives with the Central Asian countries amid the continued progress in inter-Korean relations since the historic inter-Korean summit. As KBS is hosting the upcoming Public Broadcasters International Conference in Seoul from 23 to 25 of October, Mr. Yang offered a briefing on the PBI Seoul 2018 and invited Mr. Alan Azhibayev to take part in the annual forum for public service media to share creative strategies and visions for the future. Mr. Yang added that leaders and high-profile executives from some of the most influential media organizations such as BBC and NHK are coming to Seoul to participate in the significant media event. Khabar Agency Board Chairman Alan Azhibayev said the two organizations have enjoyed friendship and co-operation since the initial agreement signed in 2014 and he would like to strengthen the relationship particularly in co-production. He also said Khabar Agency has been seeking opportunities to introduce its international service in Korea and called for the support of KBS in this endeavor of developing the Korean market. Additionally, Mr. Azhibayev invited Mr. Yang to visit Astana to take part in the Astana Media Week to be hosted by Khabar Agency in September 2018. KBS World TV, an international TV channel of KBS, is currently being broadcast in Kazakhstan through international OTT service Megogo.